The physical properties of DNA have been suggested to play a central role in spatio-temporal organization of eukaryotic chromosomes. Experimental correlations have been established between the local nucleotide content of DNA and the frequency of inter- and intra-chromosomal contacts but the underlying physical mechanism remains unknown. Here, we combine fluorescence resonance energy transfer (FRET) measurements, precipitation assays, and molecular dynamics simulations to characterize the effect of DNA nucleotide content, sequence, and methylation on inter-DNA association and its correlation with DNA looping. First, we show that the strength of DNA condensation mediated by poly-lysine peptides as a reduced model of histone tails depends on the DNA’s global nucleotide content but also on the local nucleotide sequence, which turns out to be qualitatively same as the condensation by spermine. Next, we show that the presence and spatial arrangement of C5 methyl groups determines the strength of inter-DNA attraction, partially explaining why RNA resists condensation. Interestingly, multi-color single molecule FRET measurements reveal strong anti-correlation between DNA looping and DNA–DNA association, suggesting that a common biophysical mechanism underlies them. We propose that the differential affinity between DNA regions of varying sequence pattern may drive the phase separation of chromatin into chromosomal subdomains. Spontaneous assembly of DNA molecules into compact structures is ubiquitous in biological systems. Experiment has shown that polycations can turn electrostatic self-repulsion of DNA into attraction, yet the physical mechanism of DNA condensation has remained elusive. 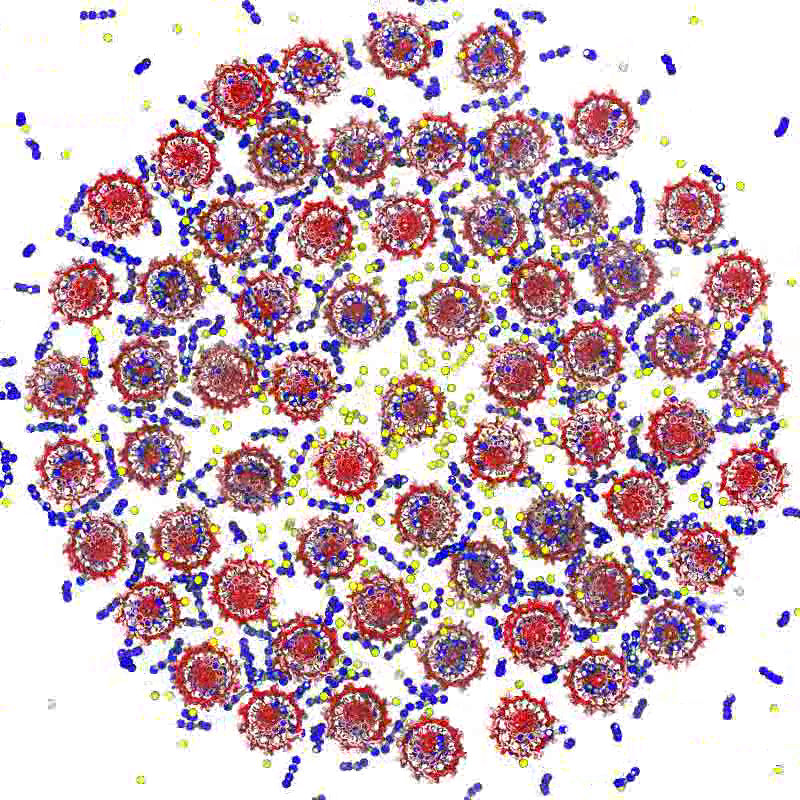 Here, we report the results of atomistic molecular dynamics simulations that elucidated the microscopic structure of dense DNA assemblies and the physics of interactions that makes such assemblies possible. Reproducing the setup of the DNA condensation experiments, we measured the internal pressure of DNA arrays as a function of the DNA–DNA distance, showing a quantitative agreement between the results of our simulations and the experimental data. Analysis of the MD trajectories determined the DNA–DNA force in a DNA condensate to be pairwise, the DNA condensation to be driven by electrostatics of polycations and not hydration, and the concentration of bridging cations, not adsorbed cations, to determine the magnitude and the sign of the DNA–DNA force. Finally, our simulations quantitatively characterized the orientational correlations of DNA in DNA arrays as well as diffusive motion of DNA and cations. DNA–DNA interactions are essential to many biological processes, including DNA replication, recombination and compaction. While side-by-side interactions between two or more DNA molecules have been the subject of many studies, end-to-end interaction of duplex DNA and its role in cell biology and DNA nanotechnology remains almost entirely unexplored. Recent experiments dem­onstrated spont­aneous end-to-end association of short duplex DNA fragments into long rod-like structures. To determine the microscopic origin, magnitude and range of forces driving this spectacular self-assembly, we carried out the first direct study of end-to-end association using the all-atom molecular dynamics method. Our state-of-the-art free energy calculations combined with brute-force simulations of spontaneous self-assembly revealed the standard binding free energy and kinetic rate constants for the end-to-end interaction. We found the end-to-end force to be strong, short-range, hydrophobic and only weakly dependent on the ion concentration. The relation between the stacking free energy and end-to-end attraction was discussed as well as possible roles of the end-to-end interaction in biological and nanotechnological systems. This work is described in a report appearing in Nucleic Acids Research. The concept of "ion atmosphere" is prevalent in both theoretical and experimental studies of nucleic acid systems, yet the spatial arrangement and the composition of ions in the ion atmosphere remain elusive, in particular when several ionic species (e.g., Na(+), K(+), and Mg(2+)) compete to neutralize the charge of a nucleic acid polyanion. Complementing the experimental study of Bai and co-workers (J. Am. Chem. Soc.2007, 129, 14981), here we characterize ion atmosphere around double-stranded DNA through all-atom molecular dynamics simulations. We demonstrate that our improved parametrization of the all-atom model can quantitatively reproduce the experimental ion-count data. Our simulations determine the size of the ion atmosphere, the concentration profiles of ionic species competing to neutralize the DNA charge, and the sites of the cations' preferential binding at the surface of double-stranded DNA. We find that the effective size of the ion atmosphere depends on both the bulk concentration and valence of ions: increasing either reduces the size of the atmosphere. Near DNA, the concentration of Mg(2+) is strongly enhanced compared to monovalent cations. Within the DNA grooves, the relative concentrations of cations depend on their bulk values. Nevertheless, the total charge of competing cations buried in the DNA grooves is constant and compensates for about ~30% of the total DNA charge. DNA is so famously known as the carrier of genetic information that the structural and dynamical aspects of the molecule are often neglected. However, most cellular processes that involve DNA cannot be understood without consideration of its interactions with other DNA and proteins. Such interactions can give rise self-assembled structures, for example DNA supercoils, which we strive to understand using a bottom-up approach by examining the most basic constituents of a larger more complex system. Thus, in collaboration with the groups of Ralf Seidel at the University of Technology in Dresden and Gero Wedemann at the University of Applied Sciences Stralsund, we have examined the interactions between DNA helices in plectonemic supercoils using magnetic tweezers, coarse-grained Monte Carlo and atomistic molecular dynamics simulations. Building on our previous work, our group characterized the effective forces between parallel DNA in monovalent electrolytes at different ion concentrations. Our simulations revealed that the force between the DNA molecules is much smaller than that predicted by the Debye-Hückel cylinder model and that continuum models fail to describe DNA electrostatics. We further demonstrate that DNA-DNA interactions in monovalent electrolyte are well described using this simple cylinder model provided a significant charge adaptation factor is employed. Application of this model in coarse-grained Monte Carlo simulations provided results in excellent agreement with experimentally obtained results over a wide range of concentrations. This work is described in a report that appeared in Physical Review Letters. The dependence of the effective force on the distance between two DNA molecules was directly computed from a set of extensive all-atom molecular dynamics simulations. The simulations revealed that in a monovalent electrolyte the effective force is repulsive at short and long distances but can be attractive in the intermediate range. This attractive force is, however, too weak (approximately 5 pN per turn of a DNA helix) to induce DNA condensation in the presence of thermal fluctuations. In divalent electrolytes, DNA molecules were observed to form a bound state, where Mg(2+) ions bridged minor groves of DNA. The effective force in divalent electrolytes was predominantly attractive, reaching a maximum of 42 pN per one turn of a DNA helix.